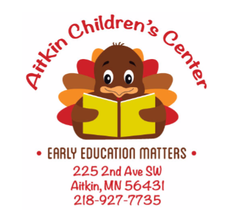 Ensure that your child is counted on the Aitkin School District’s Early Childhood Census Report. Inclusion on this report will guarantee that you are provided with information on early childhood classes, dates for early childhood screening, and kindergarten enrollment. Contact Amanda Ashton at 218-927-7735 to make sure your child is on this list. You may also email Amanda at aashton@isd1.org. Share this information with new families in the area. Please note: Contact information will only be used for school mailings.